The latest addition to my collection, another world map from the Pickwick Gallery in Stratford-Upon-Avon from where I source most of my new additions. 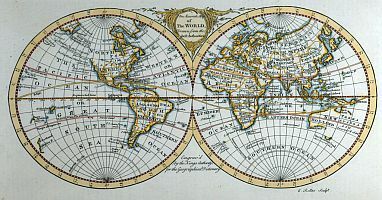 Title “An accurate map of the world drawn from the best authorities”. 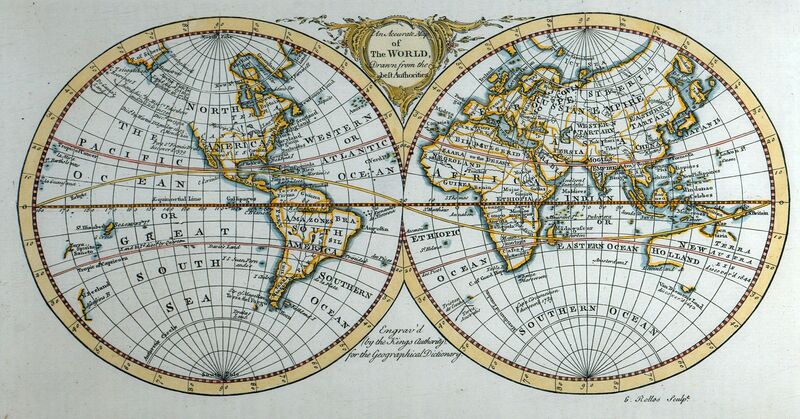 This one is taken from the “Geographical Dictionary”, 1760, engraved by George Rollos and as far as I can ascertain drawn by Sieur Robert de Vaugondy, geographer to the French king. These smaller hemisphere maps (the map measures approx 30cmx16cm, or 12″x6″) are difficult to find in good condition since they are usually folded at the front of folios so would get thumbed through over the centuries. This one is, as far as I can tell, in perfect condition (the apparent fading above is due to uneven light while scanning since it was already framed). Much of Australia (“New Holland”), New Zealand and the west coast of America are non-existant, although the Falkland Islands, which are back in the news with the 30th Anniversary of the Falklands War, is clearly marked! This is despite it being uninhabited at this stage (it is not until a few years later that the first (French) colony is founded with the British setting up a colony a year later in 1765. Another nice feature are the dates of various discoveries. These features can be found using the zoom below. Explore the map below using Magic Toolbox‘s excellent plugin Magic Zoom Plus to see more detail.